I'm Just loving this adorable Singing in the Rain Collection! Today I have a tag to share with you. Other Products: Pearl Black Cardstock, Distress Oxide Ink Black Soot, Misti, Big Shot Plus, VersaMark, Ranger Ultra Thick Embossing Powder, Black chipboard tag 3 3/4” x 8 3/4”, Blue sheer ribbon from Michael’s, Bow-it-All V2, I 3/4” Stampin Up Circle Punch, Hot Glue Gun, Hole Punch, Dimensional tape, Quickie Glue Pen. Instructions: Tag is 8 3/4” x 3 3/4”. Cut a piece of black pearl cardstock the same dimensions as the tag. Cut a piece of paper with the boots and the wheel barrel from the Singing in the Rain Paper Collection the same dimension. Use the circle punch to cut the top of the designer paper and the black pearl paper to match the shape of the chipboard tag. Ink the edges of the designer paper with Black Soot ink using the stack and store daubers. Adhere the designer paper to the black pearl paper using dries clear adhesive and punch a hole in the top. Cut the Festive Holiday Die twice from the beautiful dark blue paper from the paper pad. Cut it four more times from the black pearl cardstock. 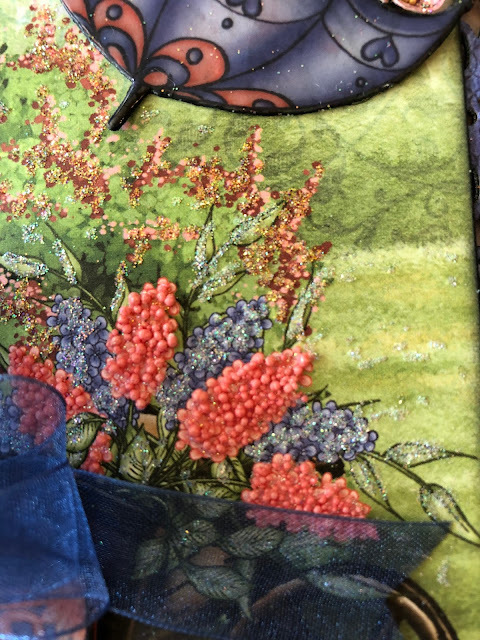 Back the blue layer twice with two of the black layers using dries clear adhesive to create a strong decorative element. Adhere them to the back of the designer paper as shown and then adhere to the tag using dimensional tape. Glitter the paper with Crystal Ultrafine Glitter and Lion’s Mane Ultrafine Glitter using the quickie glue pen. 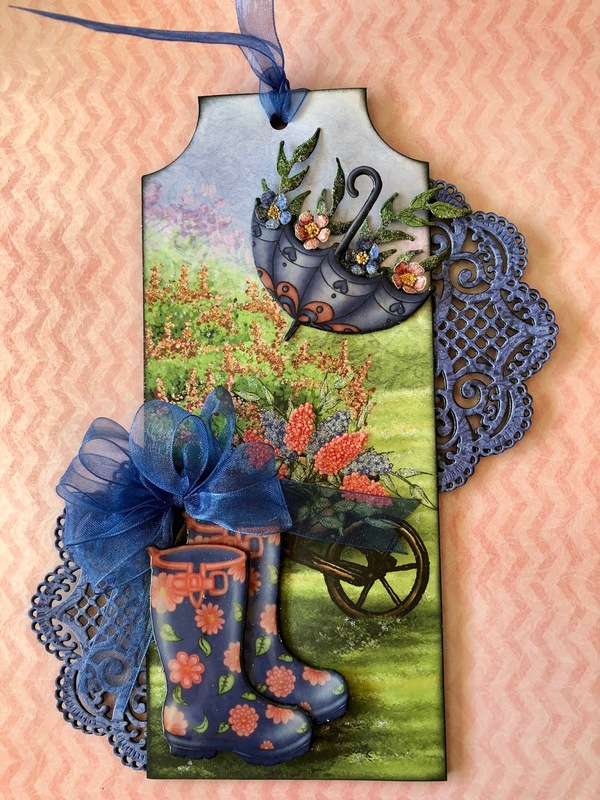 Dot the lilacs with the glue pen and sprinkle with Coral Sea Prills. Diecut the umbrella and the boots from the paper collection using The Rain Boots and Blossoms Die and the Singing in the Rain Die. Cut them again from black pearl cardstock and adhere together. 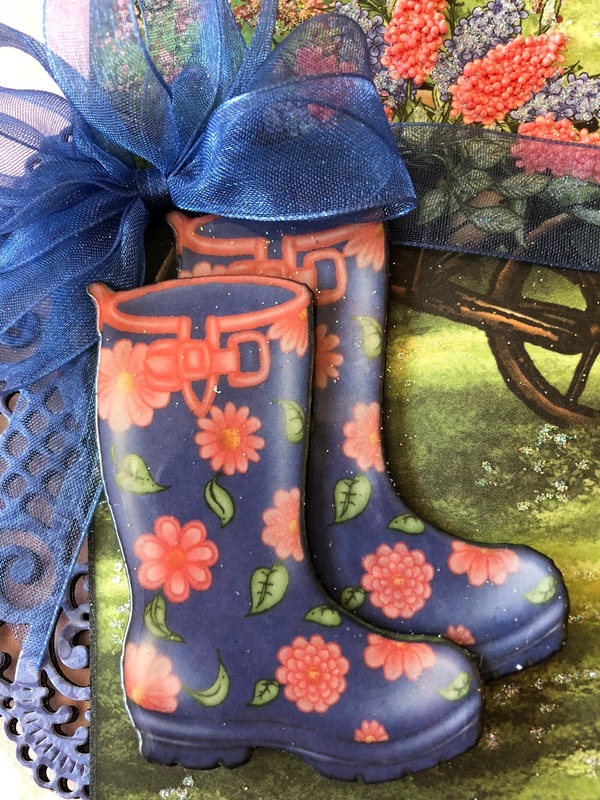 Cover the umbrella and boots with VersaMark and sprinkle with Ranger Ultra thick Embossing Powder and heat set. Repeat the process to get a real thick shine. Adhere the boots to the tag using dimensional tape. Adhere the umbrella to the tag using the hot glue just around the edges. Adhere the boots using pieces of dimensional tape. Stamp the Wildwood Florals on paper from the collection using Tuxedo Black Ink and diecut using coordinating dies. Stamp the leaves from the Rainboots and Blossoms stamp set on the designer paper with Tuxedo Black and diecut using the coordinating die. Use the Floral basics mold to shape the flowers. See the video above. Shape the leaves with the deluxe Flower Shaping Kit. Sponge the flowers and leaves with dries clear glue and sprinkle with crystal transparent glitter. Add a little dries clear glue to the centers and sprinkle with heart of Gold Prills. 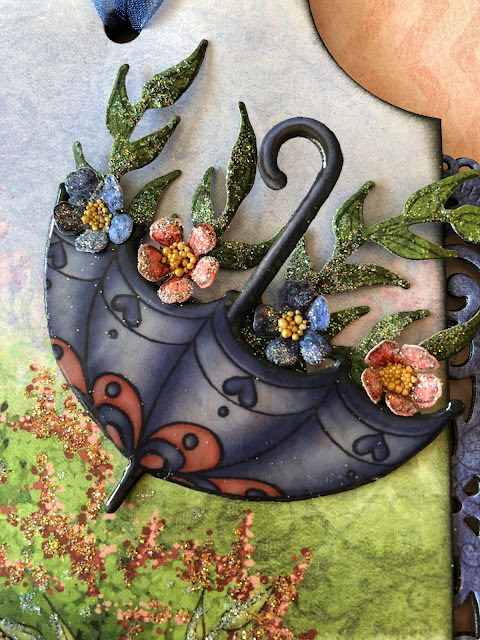 When dry, adhere the flowers and leaves to the umbrella as shown with the hot glue gun. Use the Bow-it-All to create a multi-loop bow and adhere it using the hot glue gun. Add another piece of ribbon at the top. Thank you so much for stopping by! Have a beautiful day! Gorgeous! Love how you have used the prills for the flowers. Oh I especially LOVE your umbrella! Wow, beautiful dimension and your boots are so cute too!